Freechoice: Discover Lyon’s historic significance by traversing its hidden traboules, secret passageways dating back to the 4th century, and visit Notre Dame Basilica for views across Lyon. Alternatively, walk the cobblestone paths in the medieval hilltop town of Pérouges. Or visit the exclusive culinary school of Paul Bocuse and perfect the art of French cuisine before sampling some of the delicious fare. 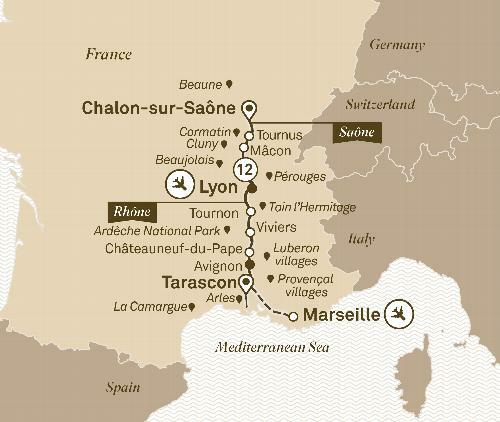 Cruising from Lyon, take in the picturesque riverside panoramas as you glide effortlessly toward Tournon. If you are feeling more active you have the opportunity to cycle from Andance to Tournon. On arrival, enjoy a fun lecture on the French paradox and etiquette. Freechoice: Enjoy a unique wine tasting in the wine cave of Tournon Castle, or join a guided walk of Tain l’Hermitage including a tasting at Valrhona Chocolates. You could also enjoy a group bike ride along the Rhône to neighbouring villages, or hike Heritage Hill for a tasting of the region’s delicious varietals among the vines. Freechoice: Shop with a Chef at a local food market and cook up a storm in Scenic Culinaire with your fresh ingredients. Alternatively, drop into the villages of the Luberon region including Gordes and l’Isle-sur-la-Sorgue, or take an excursion to Uzès and Pont du Gard. Explore Avignon at leisure this afternoon. Freechoice: Take in the wild beauty of Saintes-Maries-de-la-Mer and visit the Parc Ornithologique. Alternatively, visit the fortified Mediterranean village of Aigues-Mortes, or join a guided cycling tour to the Abbey of Saint-Roman cave monastery. Or for something more relaxed, stay on board for a Provençal soap-making workshop.